Why do I find this photo so exciting? Because here is a woman taking a full load of children to their destination, completely human-powered, casually dressed, like it’s the most normal thing in the world. And in Copenhagen, it is. 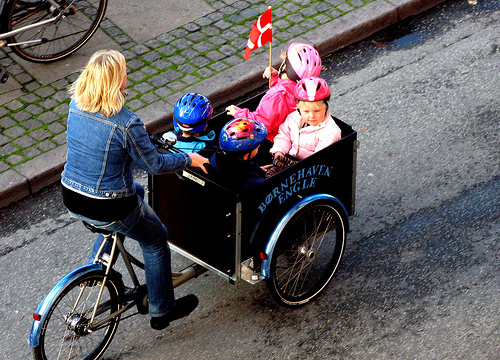 With this blog we hope to bring Copenhagen Bicycle Culture to the world. In city councils around the world they speak of ‘Copenhagenizing’ their streets to accomodate bikes. Here in the Danish capital, it’s just a way of life, as the photos and blog entries will highlight. Copenhagen is already regarded as the best cycling city in the world and those of you out there who need inspiration for cycle advocacy in your towns and cities can find a wealth of info here. I need inspiration! And one of those cargo bikes, while we’re at it!